“My son in primary school did not attend a birthday celebration because it was cancelled due to bad air — and we live in Seoul, a great place to live,” said Dr. Frank Rijsberman, director-general of the Global Green Growth Institute (GGGI). He was speaking to delegates of a forum that discussed creating environmental policies while enabling economic and regional cooperation among countries in the Belt and Road route during the 51st annual meeting of the Asian Development Bank (ADB) that concluded over the weekend.The initiative covers more than 65 countries — or more than 60% of the world’s population — that includes Africa and Europe and plans to mobilize 150 billion dollars in investments over the next five years. The forum took cues from Rijsberman’s story of living in Seoul, the capital city of South Korea, one of the poorest countries that in 50 years became an example for many developing countries to demonstrate the importance of economic growth while being mindful of air quality and the overall livability of the environment. The “Green Growth and Regional Cooperation” forum was a side event hosted by GGGI with an expert panel that discussed China’s proposed Belt and Road Initiative (BRI) and, with many references to “green growth,” “green policies” and “green investments,” looked at putting in place policies to accelerate green investments and green technology while exploring ways to create opportunities that address poverty across countries. “Climate change is already exacting its toll, particularly in the Asian region, so rapidly that technological and economic growth (that may have worsened issues like air quality) should also be our most immediate driver of action to do something,” said Rijsberman. He said there is a need for countries to have “green growth,” a new development approach that delivers environmentally sustainable and socially inclusive economic growth that is low-carbon and climate resilient; prevents or remediates pollution; maintains healthy and productive ecosystems and creates green jobs, reduce poverty and enhance social inclusion. Rijsberman said the GGGI will join the Green Belt and Road Coalition and currently cooperates with the China Ministry of Ecology and Environment and the ASEAN Center for Environmental Cooperation on regional cooperation and integration that facilitates sustainable urban development and supports high-level policies and impactful knowledge sharing on the adoption of sustainable growth in the Belt and Road countries. Prof. Dongmei Guo, China state council expert of the China-ASEAN Environmental Cooperation Center, said the BRI brings together two regional trade corridors: the Silk Road Economic Belt that will link China with the Persian Gulf and the Mediterranean Sea though Central Asia and West Asia with three routes: China-Central Asia-Russia-Europe through the Baltic Sea; China-Central Asia-West Asia-Persian Gulf through the Mediterranean Sea and China- Southeast Asia-South Asia through the Indian Ocean; and the 21st Century Maritime Silk Road that stretches from the South Pacific Sea to Europe with two roads — Coastal China-South China Sea-Indian Ocean-Europe and Coastal China-South China Sea and South Pacific. The initiative covers more than 65 countries — or more than 60% of the world’s population — that includes Africa and Europe and plans to mobilize 150 billion dollars in investments over the next five years. Initiated in 2013, the BRI aims to create the world’s largest platform for economic cooperation, including policy coordination, trade and financing collaboration, and social and cultural cooperation. Goals 6, 12, 13, 14 and 15 enjoin countries to ensure availability and sustainable management of water and sanitation and sustainable consumption and production patterns, to take urgent action to combat climate change and its impacts, conserve and sustainably use the oceans, seas and marine resources for sustainable development and to protect, restore and promote sustainable use of terrestrial ecosystems, sustainably manage forests, combat desertification, and halt and reverse land degradation and halt biodiversity loss. Guo said among some of the concerns in the countries along the route are water shortages, water pollution, agricultural pollution, tailings, industrial wastes, and nuclear waste for Central Asia, biodiversity loss, water pollution and urbanization-led pollution in South Asia, and biodiversity, forest fire and haze brought by conventional pollution in Southeast Asia. Winston Chow, GGGI country representative for China, said the program is still in its initial phase but is seeing an estimated investment of 500 billion dollars through 2030 that will be invested in the developing world along the BRI route, with 300 billion of that being carbon-related. He cited the strong collaboration with Mongolia after its policy makers were introduced to energy efficiency with air quality restrictions and environmental impact reductions through the introduction of the electric vehicles tariff in the capital Ulaanbaatar that successfully reduced bad air from 2016 to 2017. Jordan, Indonesia and Ethiopia are also underway in their ecological restoration and water treatment practices. Transformative projects among Chinese technologies in solar energy use, e-transportation and e-mobility technology, land restoration, water and solid waste treatment and solar, wind and energy building efficiency projects will also be shared as well with participating countries. The gap is also shown in Chinese investments in green projects that can be worth 100 million dollars but some countries can only do projects in the 20 or 30 million range. He cited BRI large scale projects such as airports in Cambodia or Vietnam’s hydropower plants and dams. In his press conference prior to the GGGI side event, ADB President Takehiko Nakao lauded China’s Belt and Road Initiative as a key program to connect countries and regions and to broaden integration and cooperation across Asia, and that the ADB will participate in this initiative when needed. He enjoined countries along the route to be careful not to take out excessive loans when they get involved in the initiative to finance their projects and to look closely at the benefits the projects can give to their citizens. Rijsberman, GGGI’s director-general, said the GGGI, a treaty-based international organization headquartered in Seoul, South Korea, is seeing good examples of green efforts such as the Pacific greening in Vanuatu, the eco-towns in the Philippines, the business models in Indonesia that prevent fires and rehabilitate forests, the efforts in Rwanda to eradicate plastics and the biodiversity protection efforts in the Greater Mekong area. “Efforts go beyond protecting environment but more on promoting it,” he said, stressing that such initiatives are all anchored on landmark agreements such as the UN SDGs and the Paris Climate Agreement. 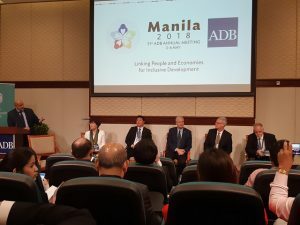 The 2018 ADB Annual Meeting, themed “Linking People and Economies for Inclusive Development,” was held on May 3-6 2018 in Manila, its headquarters. It gathered more than 4,000 delegates and brought together experts of different disciplines who discussed framing global economic shifts, re-examined governance structures, explored governments and development institutions’ adapting new opportunities while addressing challenges presented by an increasingly digital future. The ADB estimates Asia’s infrastructure needs could reach 22.6 trillion dollars through 2030, or 1.5 trillion annually. If climate change adaptation measures are adopted, the cost would rise to over 26 trillion. Established in 1966, it is owned by 67 members—48 from the region. In 2017, ADB operations totaled 32.2 billion dollars, including 11.9 billion in co-financing. The post Belt and Road Initiative Vows Green Infrastructure with Connectivity appeared first on Inter Press Service.